Dale Steyn has become South Africa's leading Test wicket-taker by dismissing Pakistan's Fakhar Zaman in the first Test at SuperSport Park, Centurion. Fakhar edged to Dean Elgar at second slip to give Steyn his 422nd wicket and take him past Shaun Pollock, whose record had stood since he quit in 2008. "He is a true leader of the attack and deserves the record," said Pollock. 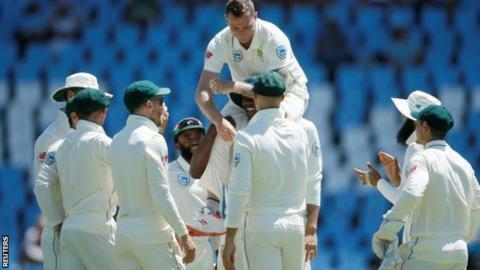 The former fast bowler was commentating on television at the time of the wicket and offered a thumbs-up signal to 35-year-old Steyn, who responded with the same gesture after being lifted shoulder-high by celebrating team-mates. It proved to be Steyn's only wicket as fellow paceman Duanne Olivier claimed a Test-best 6-37 to bowl the tourists out for 181 in just 47 overs. In response, South Africa reached 127-5 at the close, with Temba Bavuma (38 not out) and Steyn, who was unbeaten on 13, at the crease as they helped to halt their side's collapse. Only for a series of injuries, which kept him out of 27 Test matches, Steyn would surely have bettered Pollock's mark sooner. He returned for the series against India in January this year but suffered a heel injury in the first Test which caused him to miss the rest of the series and the subsequent series against Australia. Steyn is now 11th on his own on the all-time list, needing to better New Zealand's Richard Hadlee on 431 to claim a place in the top ten. The list is led by Sri Lankan spinner Muttiah Muralitharan who took 800 Test wickets while England's James Anderson is the leading fast bowler on the list, having taken 565 wickets.